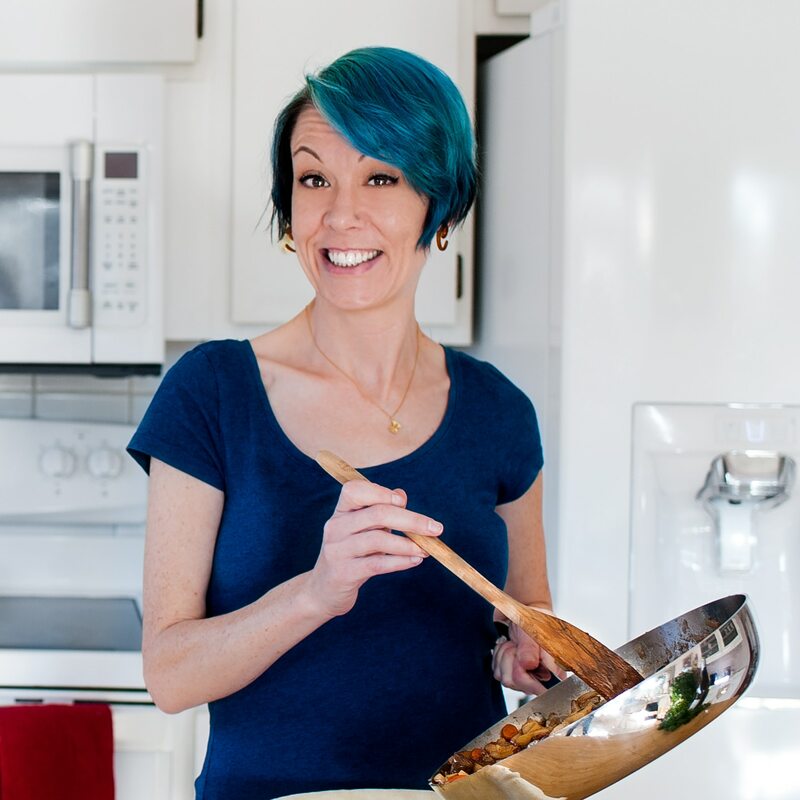 When I first learned how to make Pad Thai, it was a dreamy situation: I was on vacation in Thailand during a bout of perfect weather, cooking in an outdoor kitchen surrounded by tropical greenery. I was taking a Thai cooking class in Chiang Mai, up in the northern part of the country, where there seems to be three or four cooking classes for every city block. Earlier in the day our teacher had walked us through the local market, where we hand-picked our fresh meats, herbs, fruits and vegetables. In Thailand, teaching westerners (or farang) how to cook is a great way for locals to make extra money for their families, and throughout the country you’ll see households building small multi-station outdoor kitchens in their yards so they can share their family recipes with a bevy of eager tourists. It’s a major win for the tourists, too, because these little cooking schools provide a great way to learn about Thai cooking from the best teachers imaginable: the people who have been cooking Thai food for generations. I’ve always loved Thai cooking, but I was completely unprepared for how eating my way through the country would ruin me for Americanized Thai food forever. When you’re actually in Thailand, the food you eat is unbelievably fresh; often the meat you’re eating was walking (or swimming) that day, and the vegetables were picked not long before they appear in market stalls. Once you’ve had the real thing, it’s tough to go back to eating in greasy American restaurants. Before you accuse me of hating on American Thai restaurants, there are a few that I’ve really enjoyed – but as with pretty much any international cuisine, what you get here pales in comparison to what you get when visiting a dish’s native land. So what was a weary, culinarily-jaded traveler to do upon returning home? I’ll tell you what I did – I tried my damndest to recreate the authentic flavors of the dishes that I’d had when I was abroad. I’m lucky enough to live in the Bay Area, where international grocery stores are almost as common as gas stations, so it wasn’t difficult for me to ferret out a pantry’s worth of Thai ingredients (if you live in a major metropolitan area, there’s probably a Thai grocery near you – I encourage you to go explore!). Why a Pad Thai Recipe? 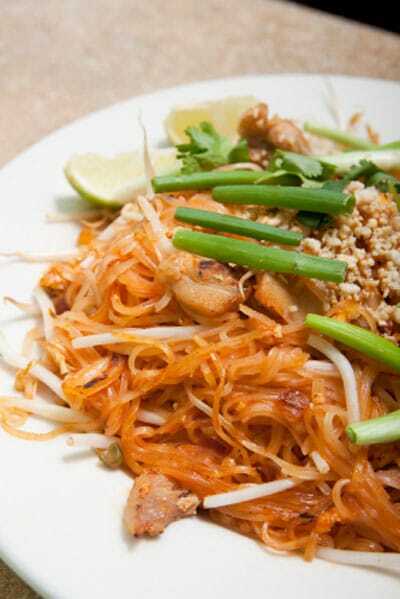 Perhaps the most well-known Thai dish here in the United States is Pad Thai, or Thai-style fried noodles. This sweet-salty-sour dish is made to order from food carts all over Bangkok, where the smell of frying chicken, egg and garlic wafts down almost every soi as corner cooks peddle their wares. And every street cart has its own style, so you could eat a different Pad Thai recipe five times a day and never have the same dish twice. It’s almost impossible to stay hungry in Thailand. There is food everywhere. A little history on the dish: my Thai cooking teacher told me a story of Thai prime minister Luang Pibulsonggram decreed the Pad Thai recipe as a national Thai dish sometime during Word War II, and that the Thais hold it up as a very important recipe in their culinary history. Further research told me that Pibulsonggram popularized the dish in an effort to reduce rice consumption so there was more to export to other countries, and some sources also say that after the war, the Thai government used Pad Thai as part of their plan to decrease the unemployment rate of the people by adopting a new trend of noodle-making and noodle-house dining. Regardless, Pad Thai is an incredible flavorful dish with a balance of many flavors, which is a priority in Thai cooking. If you make it at home, it’s leagues better than most Pad Thai that you’ll find at your local takeout joint! This Pad Thai recipe is adapted from the one I made all those years ago, on my first trip to Thailand. I remember how fun it was to work in the outdoor kitchen, stirring the ingredients in the wok while the aroma of the meat and spices overwhelmed my senses. I still get a little dreamy whenever I walk by a Thai restaurant, as that very same smell washes over me. There really are few things that smell better than an authentic Thai kitchen. Heat oil in a wok over low heat. Add garlic and fry until fragrant, about 30 seconds. Immediately add chicken to prevent garlic from burning and turn the heat up to medium, cooking for 2 minutes. Add tofu and cook for 1 minute, folding gently to avoid scrambling the tofu. Push everything to one side of the wok with a spatula, clearing an empty space for the egg to fry. Crack the egg into the empty space and scramble for 1 minute with a spatula. Once egg is well cooked, gently fold all ingredients in the wok together. Pour 1/2 cup water into the wok and add the rice noodles, stirring until the noodles are tender, about 4 or 5 minutes. Drizzle fish sauce and oyster sauce over the contents of the wok, then sprinkle sugar over the entire thing. Fold gently to incorporate, then stir in bean sprouts and spring onions. Cook for 1 minute and remove from heat. Serve hot, sprinkled with lime juice, chopped peanuts and spring onions. Serve hot!